A wildlife adventure unlike any other, this itinerary offers the chance for close encounters with mountain gorillas and beautiful golden monkeys. 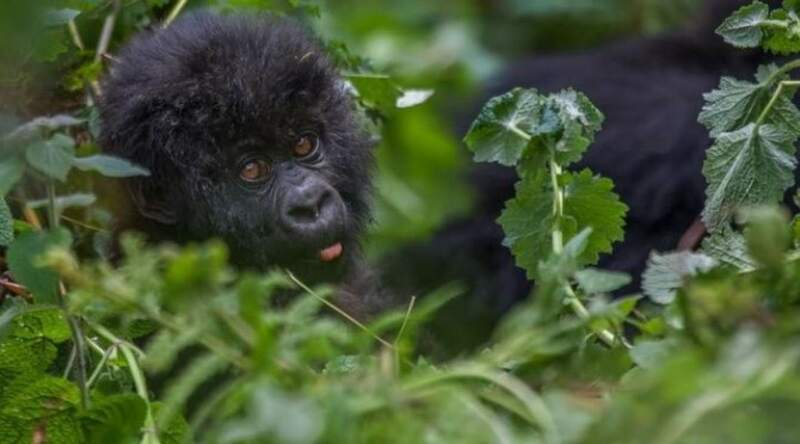 Hike the densely forested slopes of Rwanda’s picturesque Virungas Volcanoes in search of the world’s largest population of wild mountain gorillas. Gaze out onto soaring mountain slopes enveloped in lush and tropical vegetation. Immersed in this dramatic natural setting, enjoy the opportunity to watch the intriguing interaction between gorilla families or set out in search of troops of the enchanting golden monkeys. This itinerary is ideal for anyone eager for a glimpse of these great primates while undisturbed in their beautiful natural setting. This itinerary is ideal for wildlife enthusiasts who are both repeat and new travellers to the African continent. You will have the life changing opportunity to view mountain gorillas in their natural habitat at the Parc National des Volcans. Upon arrival at Kigali Airport you will be met by an partner representative who will road transfer you to Kigali Serena Inn. Vibrant and colourful, Kigali is the bustling capital city of Rwanda. It spreads out over four scenic ridges and the valleys in between, with the city centre located on one hill, and the government and administrative quarter on another. The highest hill, Mt Kigali, sits at 1 850 m (6 075 ft) above sea level. Kigali’s peaceful, tree-lined streets are clean and safe, and the city boasts a selection of hotels, restaurants, shopping centres and markets. Kigali is the perfect starting point for an unforgettable gorilla trek – one of Africa’s most fascinating wilderness experiences. Spend one night at Kigali Serena Inn. Accommodation is in a standard room with an ensuite bathroom. After a scrumptious breakfast you will be transferred to Parc des Volcans where you will spend three nights. Approximately 3.5 hours’ drive. The rainforests of the Virunga Volcanoes are the last refuge of the Mountain Gorilla. The Virungas span Rwanda, Uganda and the Democratic Republic of Congo, with the Parc National des Volcans being the Rwandan element of this ecosystem. The lush slopes of the volcanoes provide an appropriately dramatic natural setting for what is perhaps the most poignant and thrilling wildlife experience to be had anywhere – to see the Mountain Gorilla in its natural habitat. Roughly half of the world’s wild population of Mountain Gorillas are resident on the Rwandan slopes of the Virungas. Seven habituated families of gorillas are visited, and these families have from seven to over thirty-five individuals in each group. Rise in the cool of dawn and look out on the misty peaks of the mountains. Tuck in to a hearty breakfast. Peer up at the majestic mist-covered slope of the mountain and soak up the anticipation as the guide briefs and the trekkers get ready. Follow in the light steps of your nimble porter as the rainforest folds in around you. Stop and take it all in; the sounds, the smells and the astonishing scenery. Feel the rush of excitement as those dim shapes and faint sounds become actual living, breathing, free gorillas. Savour every second of an exhilarating hour with the great apes. Walk tired and exhilarated back to your heroes welcome. Sink into a comfortable seat in front of a crackling fireplace and recount every moment of the encounter with your companions. Update your bucket list and sleep like a baby. After a scrumptious breakfast you will be road transferred by road back to Kigali Airport for your outbound flight. Learn more about the luxurious accommodation available for your trip. : Here, surrounded by the tropical forests of Rwanda, just a stone’s throw away from the renowned Parc National des Volcans. : Relaxed yet elegant, the Kigali Serena Hotel is situated on a charming boulevard in the heart of Kigali. We have many additional activities to keep you busy during your stay. ◦	From the safari price paid by clients Volcanoes contributes $100 per client to the Volcanoes Partnership Trust, a separate non-profit organization which undertakes community and conservation activities. •	Items of a personal nature: fax, telephone, etc. •	For adding another Gorilla Track we shall charge $750 per person per Gorilla permit. •	Single entry visas as well as East African visas (between Uganda | Rwanda | Kenya) are currently available directly upon arrival at Entebbe Airport at a cost of US$100 (same cost for both types). Please be advised that Uganda is moving towards an online visa system and may announce online visa application requirements with little notice. We will keep you informed to the best of our ability. However, to avoid any potential issues, may we recommend that clients obtain an East African visa (as detailed above) upfront and prior to travel from their nearest available Embassy (see http://www.embassy-worldwide.com/country/uganda/). When officially in place, the visas will be applied for online: https://visas.immigration.go.ug/). •	Trip cancellation, travel delay or baggage insurance. •	Charges incurred as a result of delays beyond our control. •	All statutory increases beyond our control. •	Baggage restriction of 15kgs per person (no more) is applicable on all flights in small, soft-sided bags. •	There is a minimum age limit for gorilla tracking which is strictly 15 years.